I am not a great public speaker, but I wish I was, and any tips are always gratefully received. Except the one about imagining the audience naked; I’ve never yet managed to apply that one and if I’m honest I’m slightly apprehensive about what would happen were I to attempt to do so. 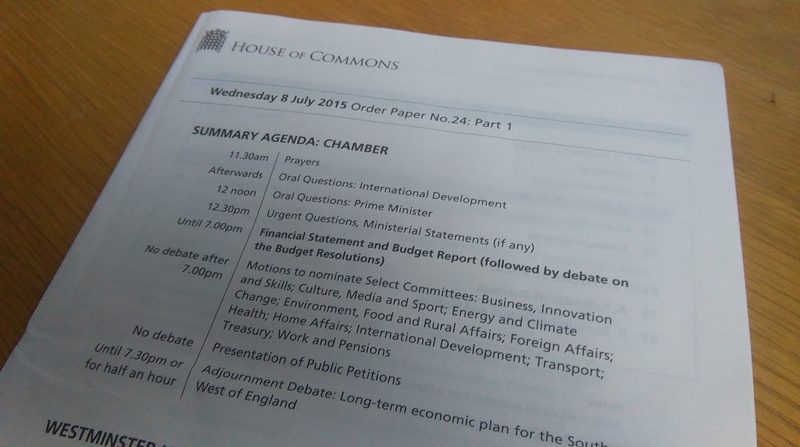 On a largely related note, yesterday was budget day and also my turn to attend prime minister’s questions. For a summary of the questions and budget speech, see any British newspaper, political blog or even Buzzfeed because you’re not going to get that here. Instead, I’m going to share with you three things I learnt yesterday. As a wannabe-better-public-speaker and a sociolinguist who dabbles her toes into the linguistic ethnography pond, I was riveted yesterday not by Osborne’s plan to save the nation’s purse but by the way he, Cameron and others did their public speaking thang. Anytime I give a paper or talk, I always print my talk out double sided and staple it in the top left hand corner, that way I can be certain that I won’t lose a page or somehow get the order mixed up. What tends to happen, though, is I stand or sit clasping my paper between both hands, setting up some kind of speech-speaker force field, and then proceed to babble as if I’m very poorly channelling the words on the page. People say you should never read a speech so, with that in mind, I usually attempt to ad lib, however, often find that my ad libbing attempts coincide with a total inability to remember how to construct a sentence. Osborne rocked up to the despatch box (the box on the table in the middle of the House of Commons where they make their speeches) and set his wad of paper down on said box. No clasping. No force field. He then set off on a steady pace, with a controlled volume, reading verbatim what was on the page in front of him. Yes, reading it. But it wasn’t boring and my attention didn’t wander because he owned the words, rather than them owning him. The speech was well crafted and so very listenable; I mean, like an audiobook, just much more political. When he got to the end of the page he didn’t grab at the wad of paper and attempt to turn over, fold, and replace said wad; he simply slid the page to the side and kept going: seamless. No ‘print-on-two-sides’ for Osborne. It’s common practice when speaking in the House to take a few stabs at the opposition, you know, mock them and their policies. This usually results in cheers from one’s fellow party members, and the whole place gets a bit noisy and raucous. People speaking yesterday dealt with this in one of two ways: 1) by pushing on; or 2) stopping to enjoy the view. Have you ever stopped half-way through cycling up a hill because you want to admire the view? The result is that it takes time and a lot of effort to start up again, right? Well, the same can be said for speeches. One lady, having made a dig at the opposition which caused her party to cheer and jeer, stopped to enjoy her moment and the view. Error. Just like peddling up a hill, she really struggled to get going again and to regain the attention of the house. It was pretty painful. She was not the only one to get cheers and jeers out of the House, but others seemed more clued up: they did not get off the bike to enjoy the view and internally pat themselves on the back for doing such a good job; instead they pushed through. The result was that they didn’t lose the attention of the House. I’m thinking that overall it was a much more pleasant ride for them, too. Lesson learnt. In contrast to Osborne and Greening (secretary of state for international development who also took questions) who stood at the despatch box to deliver their speeches, Cameron leant on it like he was waiting to get served in the pub. I mean, how much more casual and relaxed can you get? His posture, the way he interacted with the furniture around him: he totally showed it who was boss. His stance was that of someone who was so familiar with what they were doing, they didn’t even need to think about it; it was the ‘walk-in-the-park’ of public speaking postures. He was so much more chilled out than everyone else, it was like he was in his own home and so everyone else sort of had no choice but to assume the roles of guests: on their best behaviour. Man, did he own it. So, tips from the top: no staples, don’t stop peddling, and, above all, OWN IT!